A Lisburn man and former UDR soldier, Colin McAfee, launched a mobile military museum at First Lisburn Presbyterian Church this week. Colin, who served during the worst of the Troubles in Northern Ireland, wanted to honour and remember those who served during the years of Operation Banner in Northern Ireland. Operation Banner was the operational name for the British Armed Forces’ operation in Northern Ireland from August 1969 to July 2007, as part of the Troubles. It was the longest continuous deployment in the British military’s history and Colin said that many veterans felt that their service was in danger of being forgotten. “Up until now in Northern Ireland there has been no museum for Operation Banner which veterans can collectively go visit to look at their history and heritage,” explained Colin. “There are museums for the Rifles, Royal Irish Fusiliers and the Inniskilling Fusiliers but they don’t cover the period of Operation Banner. “It is a period that is shifting into history and something that many people know nothing about. Veterans of that period are not getting the recognition they deserve. Colin has spent the past two years and a substantial amount of his own money putting together extensive displays of uniforms, documents, weaponry and memorabilia from Operation Banner and his hard work will come to fruition this weekend when the mobile museum goes on display. The Operation Banner Veterans Military Museum will be at First Lisburn Presbyterian Church on Friday, Saturday and Sunday from 2pm until 5.30pm. 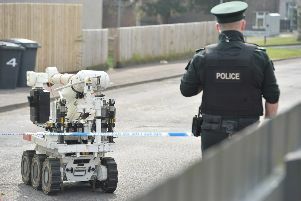 It will also form a centrepiece at this year’s Armed Forces Day event in Antrim on June 18. Anyone who would like to have the museum visit their school or venue can contact Colin by emailing operationbannerveteransmuseum@hotmail.com.